When we go out for dinner and Alisa asks me what I’m in the mood for the answer is frequently (when it’s not pizza) “barbecue or Asian,” so I guess it’s no surprise that I like David Chang so much. He’s become famous for smoky east-meets-west combinations like his bacon dashi. On his excellent series Mind of a Chef he made equally reverent visits to a top Japanese katsuobushi producer and Allan Benton’s Tennessee smokehouse, did an impressive tour of Tokyo ramen shops and drank an equally impressive amount of Kentucky bourbon. He’s also no-nonsense about flavor, and every dish of his we’ve made has been great. The Brussels sprouts recipe from Momofuku made a believer out of my dad, a lifelong Brussels sprouts hater. From the simple (has ginger scallion sauce made an appearance on this blog yet?) to the complex – and some of his recipes can get mind-numbingly complex – many of his recipes have become household favorites for us. 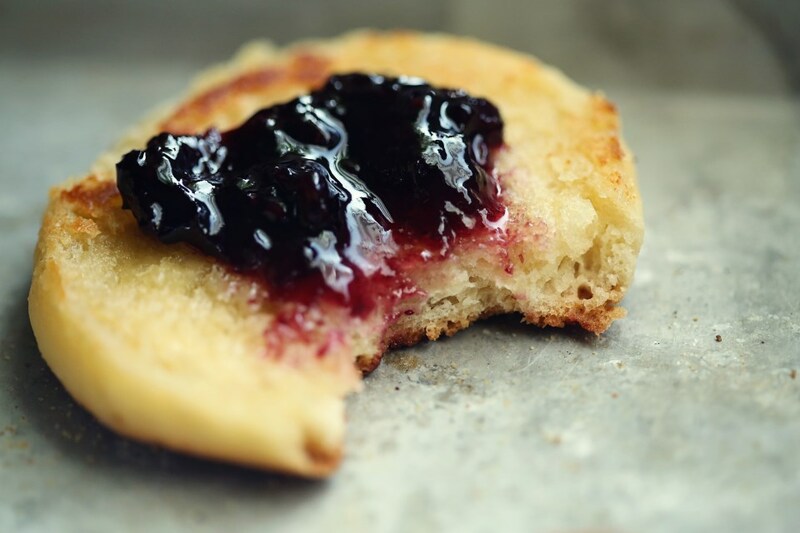 What does this have to do with English muffins? This recipe actually comes from the Momofuku cookbook, and as a bread lover and general fan of everything Chang does, I’ve been wanting to try it for a while. 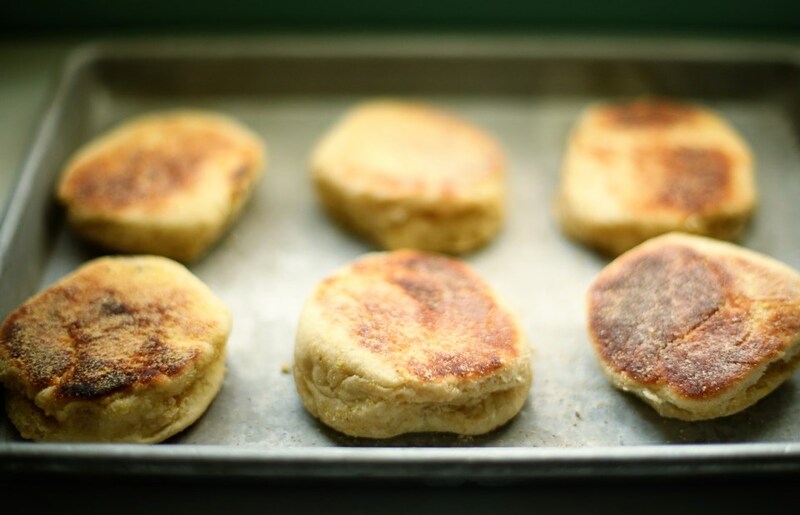 I actually made this on a recent Sunday night, perhaps fueled by the return of Downton Abbey, and had to laugh when I realized I was cooking English muffins out of an Asian cookbook at midnight. 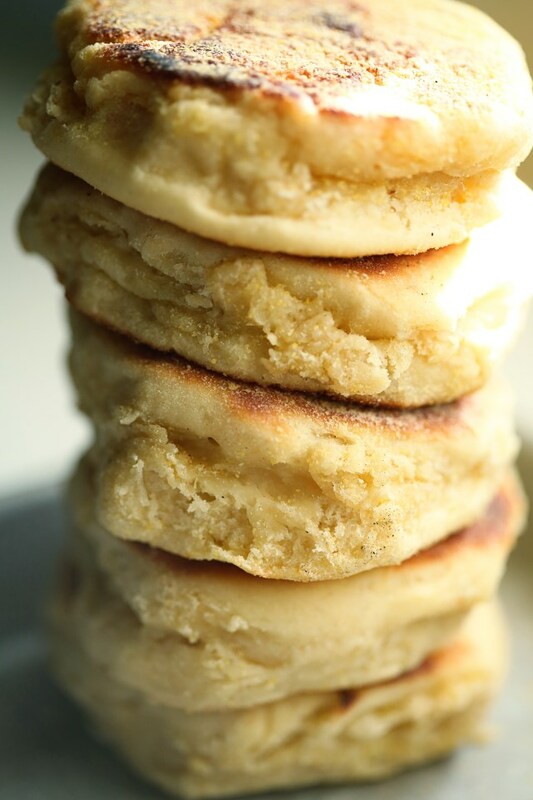 These are fun to make – the dough is very delicate, and there’s something really satisfying about laying them into a pan that barely seems warm and turning them gently until they seem somehow sturdier, then start to pick up the first hints of the golden brown color we associate with English muffins. As with every other recipe from this book, they were delicious, and as with every other bread recipe I’ve tried I feel like I could spend years trying to master it. This recipe is actually from Chang’s chef, Milkbar genius, Christina Tossi. Here’s a link to the chef herself making these, step by step. There’s really no way to improve this recipe and we followed it to the letter. Also, I don’t want to write out 16 steps.